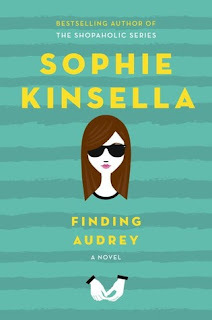 Because I've been so out of the loop, I had no idea that Sophie Kinsella was releasing her very first young adult novel. So when Finding Audrey arrived at work, I was pleasantly surprised and it wasn't long before I decided to purchase it. The theme of the book immediately intrigued me. It explores issues regarding fourteen-year-old Audrey's mental health following a major bullying incident at school, and how she progresses in the months following. 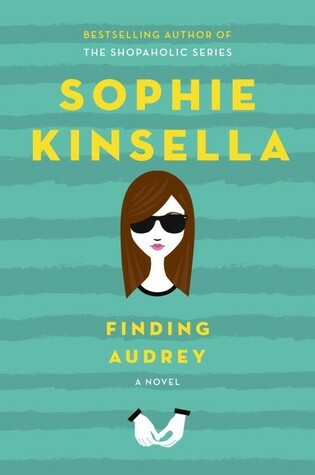 I admire Kinsella for taking on such an important subject, and having dealt with anxiety issues throughout my life, I felt that the often misunderstood subject was well respected, and the writing accurate and insightful. I even took down several page numbers for future reference! But with that being said, I've always had a bit of a love/hate relationship with Kinsella's novels. While I seem to buy every one she releases, I find some of her characters rather annoying. And unfortunately, the characters in Finding Audrey weren't really an exception. Though I could identify with Audrey, I didn't feel as connected to her as I would have liked. Her mother also reminded me of a more typical Kinsella character – high strung and a little bit silly. But as the novel moved on, I warmed up to her. Altogether, Finding Audrey is a thoughtful and inspiring novel that teens and adults alike can relate to. While it wasn't perfect, I would definitely recommend it to anyone who has experienced anxiety or has ever felt like an outsider. I certainly wish this book was around when I was a teenager. 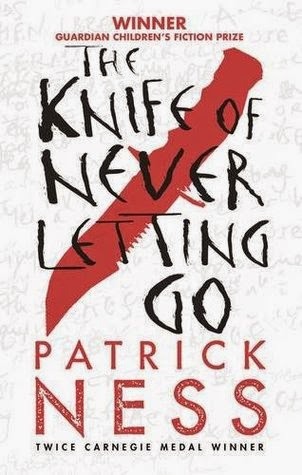 You may recall me mentioning The Knife of Never Letting Go, and how I came across it, in my last blog post. It's admittedly the first book that I've read cover to cover for months (though this doesn't include two or three audio books which I've listened to in the meantime). I'd say that the novel has automatically earned a place on my 'top reads' list, purely because of the way it pulled me in and inspired me to read again. Many books have tried over the months, but this is the only one that could pique my interest and keep it there. Although, having said that, it wasn't perfect. I found the language, grammar, and spelling a little annoying at first, though I soon got used to it. This is actually an important element to the story, as the protagonist, Todd, narrates the book and everything he tells us can also be heard by the characters around him. It's part of his stream of consciousness, or his 'Noise' as it's called in the book, and reflects the way that he speaks out loud. The novel's emotional elements are really what drives it forward. 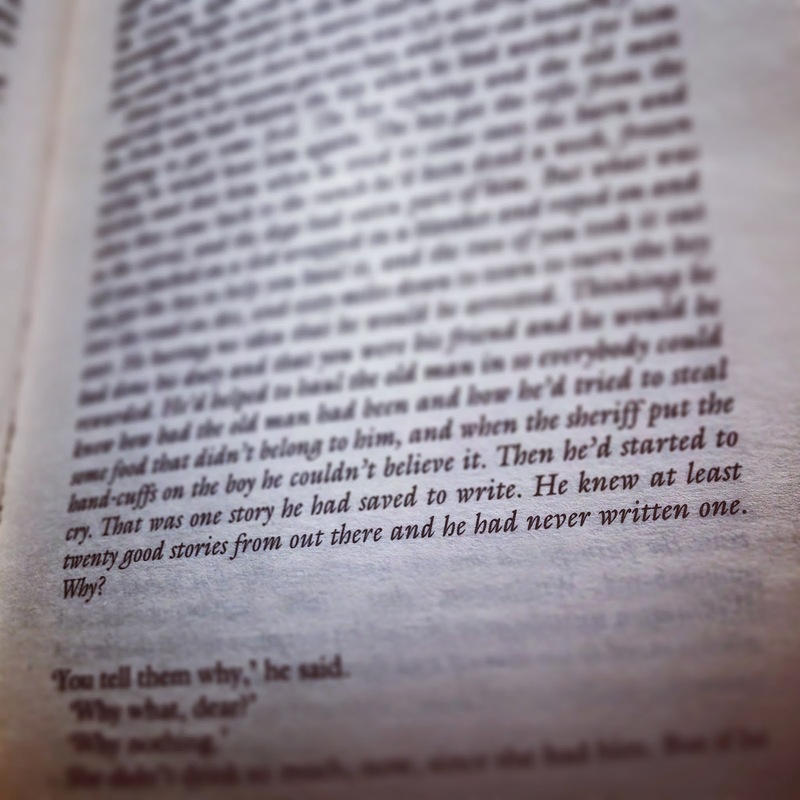 At one point, I had tears in my eyes from reading a particularly heartbreaking scene. The characters are also strong and believable, and I found myself identifying with Todd and his ever changing world. There are two more books after this which I'm thinking about reading at some point in the future, though I didn't find the ending strong enough to have me leaping into the next installment straight away. 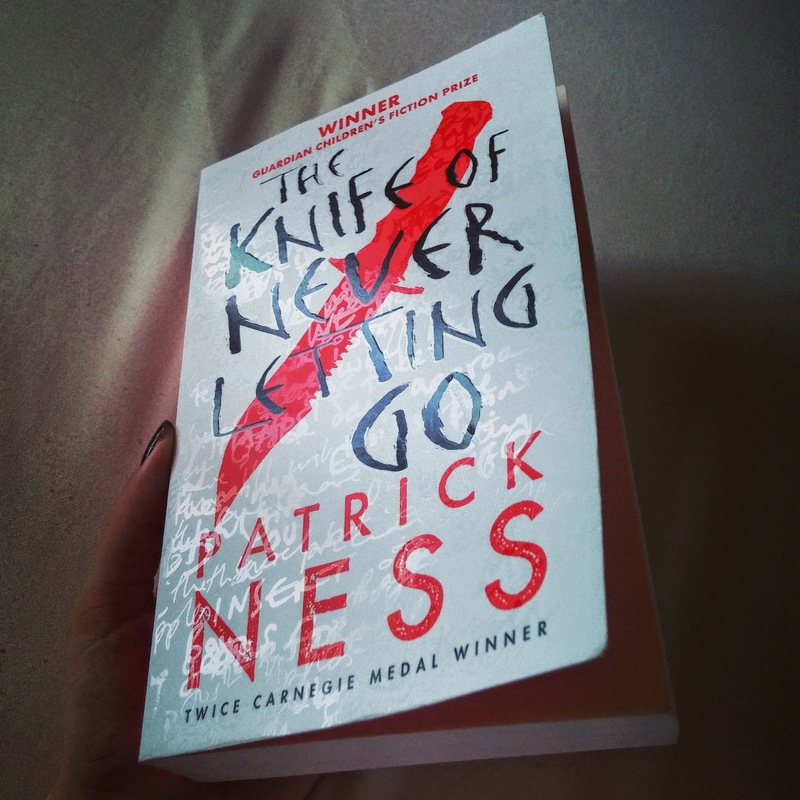 Altogether, The Knife of Letting Go is a fast paced and exciting novel. I would recommend it to anyone who enjoyed The Hunger Games trilogy or The Maze Runner series. Since my last post, even more has changed. Having tried and failed at a couple of jobs which didn't suit me at all (but I tried so I didn't really fail, and that's how I'm choosing to look at it), I finally landed a role working at WHSmith. And when I'm not helping to man the tills, most of my day involves sorting through the books department. That's right, books! I'm about to go into my fourth week there, and though it's been a challenge, I'm really starting to enjoy it. Being around books and feeling productive and connecting with people again has been really helpful in getting my mind back to a place where I can see a clearer picture for myself moving forward. The past few months haven't been easy on me. It's been hard. The job search seemed long and brutal, and I went to so many interviews before I got to where I am now. It really knocked my confidence. On top of that, I've been trying to come to terms with the absence of someone who made a significant impact on my life at the end of last year. That's probably been the most difficult thing, trying to deal with having my heart broken and trying my best to move on from it. But it's true when they say that the challenging times really do give you an opportunity to reassess yourself and what you want from your life. I know that I have never felt so motivated and determined to improve myself and to push harder to reach my goals. Before all this, I used to just stop when things got tough, but now I use it all as motivation. As a driving force. I've become addicted to seeing results. I've continued going to the gym and eating better, and I have lost 22lbs since the start of the year. I look and feel healthier than I have in years, which I am so proud of. WHSmith's book department was not really a goal. Not a direct one, anyway. My goal, at the start of the year, was to get a full-time office job and move out of my parent's house, and try to leave the memory of this person behind me. I tried the office thing but it didn't work out. So I looked elsewhere, fell into WHSmith and, somehow, books reentered my life. The pay isn't wonderful so there'll be no moving out yet, but my hours enable me to spend more time reading, writing, exercising, and growing on a more personal level. Working there has just been so unexpectedly inspiring. Last week, as I was unloading some crates filled with various paperbacks, I came across a particular book called The Knife of Never Letting Go by Patrick Ness. I suppose it was the title that grabbed me, along with the clever cover design (I love the hidden scribbles). And you know what? I feel like it was calling me, because it's the first book I haven't been able to put down in months. Months! I haven't finished it yet, but you can certainly expect a review to pop up here as soon as I have. So I think it's fair to say that a flame has been lit within me once more. My hunger for books, for reading, and for writing has reappeared. All because of these unexpected twists which my life has taken the last few months. Just like a good story, I suppose. A story I want to write. This means that I am back, and I have decided to keep this blog going but continue making changes to its content. I'm going to be a lot more open with my posts from now on. There will certainly be a more personal element to them, but I'll also be reviewing and covering other book related topics. As I'm no longer an English Literature student, you might find that my reviews might be a little more disorderly and a little less formal. In other words, I'm going to try to think less about how I write and just let whatever comes out of my head and my heart translate onto the page. I think that's really what it's all about, all this writing. This art. You should never censor your self expression. And from now on, I'm going to try my best to do that. Just let it flow and see where it takes me. I'm riding the wave. I'll continue getting better, I'll learn to let go, and I'll learn to move forward with what matters and leave the rest behind. To quote the title of a novel written by my favourite Gilmore Girl, Lauren Graham: Someday, someday, maybe. 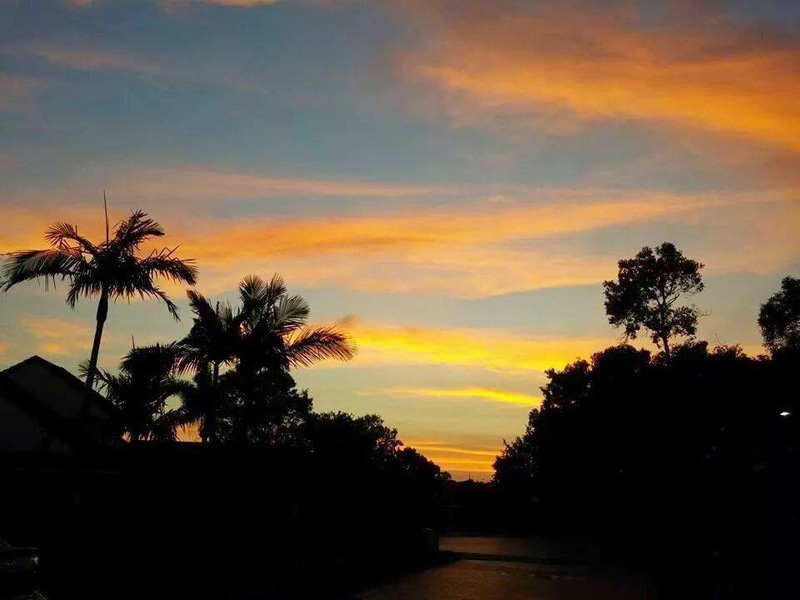 Sunrise in Queensland, Australia. November 2014. I don't really know where to start. It's been a while. I haven't posted since September, and that's pretty crazy if you consider how prolific I had been prior to that. Well, at least between 2011 and 2013. 2014. Wow. What a year that was for me. Basically, my life turned into something I just did not expect. I got a job which I enjoyed, made a bunch of new friends, had family visiting from all over the world on a couple of occasions, I travelled to Australia for a month, and had more fun than I ever thought I would have. But, in all of this, guess what I forgot to do? I forgot to read. I know what you're thinking. 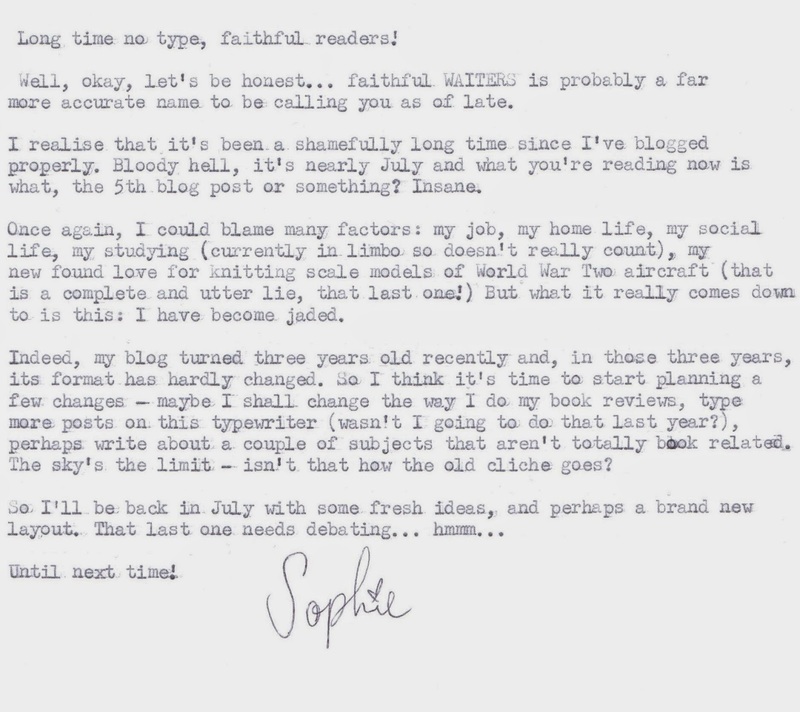 Sophie, you're a book blogger! How could you possibly forget to read? Well, that's a good question. Perhaps it's not that I forgot, so much as I just didn't make time for it. I even had to defer my university course twice because I hadn't made time to go through the materials. The thing is, though, I learnt a lot about myself last year and, with everything that went on, I started to change. By the time I arrived home from Australia at the end of November, I'd reached a bunch of crossroads: I lost my job (budget cuts), I lost a few people (various ways), and I seriously began to consider a different university degree. So in these first couple of months of 2015, I have had to adapt. I'm still looking for work, but I'm not far from finding something (a couple of interviews lined up for this week). I've found ways to cope without having certain people in my life by focusing on losing weight and getting fit (the gym and healthy eating are new addictions). And I've changed my university degree. That's right, I'm no longer an English Literature student, but a Humanities student. And that brings me to why I'm here, I suppose. The truth is, I'm just not reading anymore. Not nearly as much as I used to, anyway. And so I'm considering a few options for this blog. 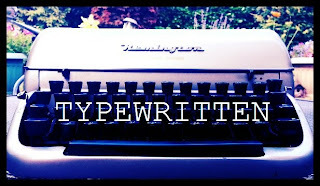 Either it will move forward as more of a general lifestyle blog (with some book reviews included every now and again), or I will set up an entirely new blog and start over from scratch – a new beginning to go with the new direction in which my life is headed. So I hope you all stay tuned a little longer while I figure this out. One thing's for sure, though: you never really know what the universe has in store for you. Okay, I have to admit -- I've only ever read one other story by Ernest Hemingway and, yes, it was about baby shoes. It's not that I haven't been interested. I read some of The Old Man and the Sea but it didn't grab me at all and, when something doesn't grab me, I usually give up within a few pages. I also own a copy of For Whom the Bell Tolls, though it has been sat on the shelf collecting dust with a bunch of other books which I'll get around to reading 'someday'. 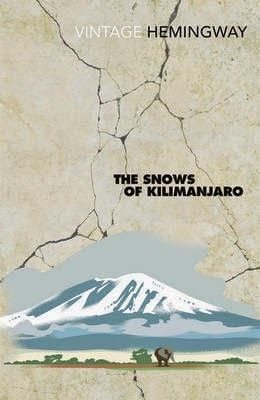 Then, yesterday, I was browsing the classics section at my local Oxfam bookshop when I came across The Snows of Kilimanjaro and other stories; eighteen of Hemingway's short stories contained within one small paperback. And being somewhat determined to find at least one piece of Hemingway which I could honestly say that I enjoyed, I purchased it. To explain the plot rather simply (and incompletely), it's about a man named Harry who is stranded in Africa, gangrene killing him, and he is looking back on his life. He fades in and out of dreams and daydreams, and in these moments we see into his mind as he reflects on all the stories he wish he had written during his life but hadn't, for one reason or another. How many of us can relate to this? Truthfully, in the moments when Harry pondered why he had procrastinated so severely, I felt as if Hemingway was speaking directly to me. Yes, enough of the fear. Enough of feeling inadequate. How can a person discover their full potential if they never even try? They can't, really. You kept from thinking and it was all marvellous. You were equipped with good insides so that you did not go to pieces that way, the way most of them had, and you made an attitude that you cared nothing for the work you used to do, now that you could no longer do it. But, in yourself, you said that you would write about these people; about the very rich; that you were really not of them but a spy in their country; that you would leave it and write of it and for once it would be written by some one who knew what he was writing of. But he would never do it, because each day of not writing, of comfort, of being that which he despised, dulled his ability and softened his will to work so that, finally, he did no work at all. The people he knew now were all much more comfortable when he did not work. Africa was where he had been happiest in the good time of his life, so he had come out here to start again. They had made this safari with the minimum of comfort. There was no hardship; but there was no luxury and he had thought that he could get back into training that way. That in some way he could work the fat off his soul the way a fighter went into the mountains to work and train in order to burn it out of his body. [...] And he had felt the illusion of returning strength of will to work. Now if this was how it ended, and he knew it was, he must not turn like some snake biting itself because its back was broken. Of course, I've only isolated one theme found within Hemingway's beautiful and tragic story (another theme touches on relationships, but I'll reserve my thoughts on that for my journal). There's really so much to get out of The Snows of Kilimanjaro, and I can't recommend it enough. You can read it online here, and purchase a copy for your shelf here. What are you thinking, Amy? The question I've asked most often during our marriage, if not out loud, if not to the person who could answer. I suppose these questions stormcloud over every marriage: What are you thinking? How are you feeling? Who are you? What have we done to each other? What will we do? 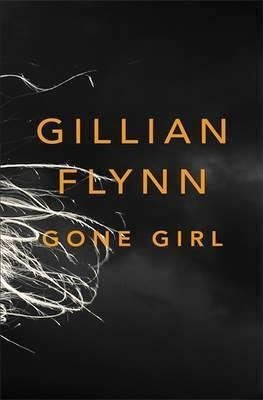 Gone Girl has been on my radar ever since I saw Gillian Flynn interviewed on Late Night with Jimmy Fallon last year. But, despite its acclaim, I was left rather disappointed. It started off well. I read the first page and was immediately sucked in to the action – the fast pace, vivid descriptions and mysterious characters kept the book firmly open in my hands. I couldn't wait to find out what was going on and where all the questions would lead. Unfortunately, though, things went downhill after the first few chapters. The plot started getting repetitive, with the characters going over the same clues multiple times. It had me wondering how long it would take to actually go anywhere. But a major, very unexpected plot twist saved Gone Girl halfway through, and that kept me interested for a while. Eventually, however, the twist also became stale and I was once again bored. And then there was the ending which, to me, was a complete anti-climax. Not to mention the two main characters, Nick and Amy, who are fantastically developed but almost completely unlikeable. I can't say more without giving too much away but, to be honest, the polarising aspects of their personalities are pretty much what make the book. Who would be getting their just-desserts? I'll still see the film version of Gone Girl which comes out this autumn, though it will be interesting to see how they treat that ending. Altogether, a disappointing and somewhat frustrating, though also intriguing, read. 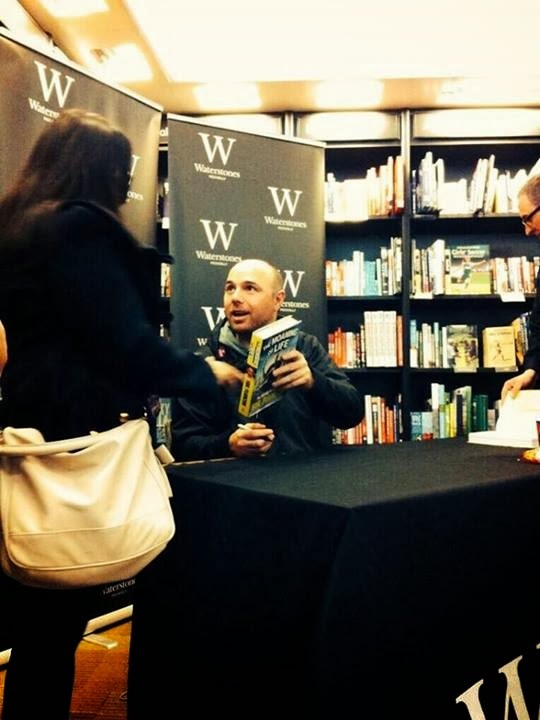 On November 23rd last year, I was lucky enough to meet one of my absolute favourite people: Karl Pilkington! He was at Waterstones' flagship store in London signing copies of his latest book, The Moaning of Life, which accompanies the TV series of the same name. It took a 6am start, almost two hours on the train and a gruelling three hour wait outside the bookshop in a line consisting of at least five-hundred people, but it was all definitely worth it for the minute or so that I had with the man himself. He's smiling! I made Karl smile! YAY me! Finally, the signature he left inside my copy of The Moaning of Life. This will have pride of place on my bookshelf for a long time to come! 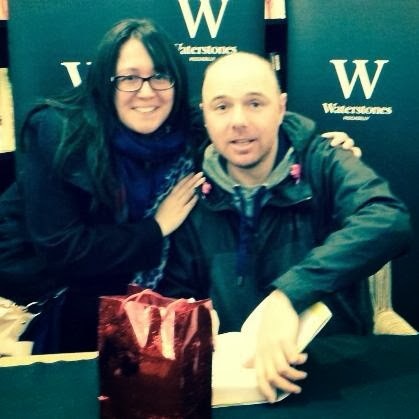 Have you met any of your favourite famous people? 1553: Harsh winter falls across the realm. Mary Tudor has become queen and her enemies are imprisoned in the Tower, but rumours of a plot to depose her swirl around the one person many consider to be England's heir and only hope-- her half-sister, Princess Elizabeth. Brendan Prescott's foe and mentor, the spymaster Cecil, brings news that sends Brendan back to London on a dangerous mission. Intent upon trying to save Elizabeth, he soon finds himself working as a double-agent for Mary herself. Though The Tudor Conspiracy is the second book in the Elizabeth's Spymaster series, it also works as a standalone novel. So, as I'd not read its predecessor, The Tudor Secret, this served as my introduction to Brendan Prescott and the world he navigates. 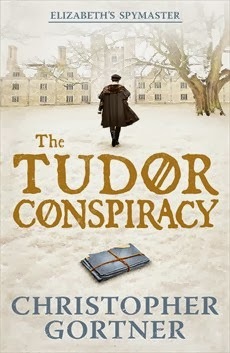 From the wonderful descriptions to the three-dimensional characters, The Tudor Conspiracy is an enjoyable read. The atmosphere Gortner creates is very evocative, and I found myself easily transported back to 1553 and its vast unpredictability under the rule of Queen Mary I. It also helped that the novel is set during winter, thus making it a fitting companion during these cold, grey days we're currently experiencing here in England! I enjoyed the characters; especially Brendan (who serves as narrator for the story) and Peregrine. 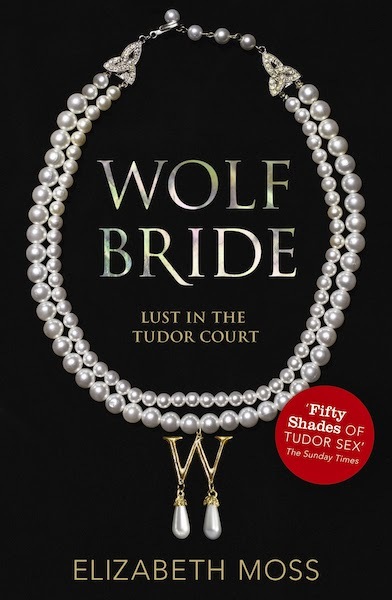 But though the background of each character is fully explained through the plot, I did feel as if I came in at a bit of a disadvantage not having read The Tudor Secret. Perhaps I would have felt more of an attachment to the characters had I started the series from the very beginning (which I may still go back and do)? Overall, The Tudor Conspiracy is a suspenseful, fast-paced read with some exciting twists. I'm looking forward to finding out what happens to Brendan in the next novel!